I only enjoyed playing again once I got enough money to buy a Playstation Portable and this is one of the games that I had along with Fate/Extra and Kagetsu Tohya. And by that I mean after I passed the Nursing Licensure Examination. After I downloaded the Gran Turismo game for the PSP though, I should say that with all of the cars and tracks in the game, I still feel that it lacked something. The game lacks customization in terms of replacing parts. All it had were customizations in terms of ride height and such, customizations that on my first impression is too insignificant to even make a change for the car to win the game. Still, I played with it, saying to myself that if this does not satisfy me, I’m ready to ditch this game for Need For Speed Most Wanted. As I play the game though, this is where my impression will be totally wrong. Game tells me where to brake properly, where to accelerate properly, and where can I make the fastest turns without me spinning out of control. Driving lines and warning signs tell me what I should do if this happens. And there I found out that I am a reckless driver. 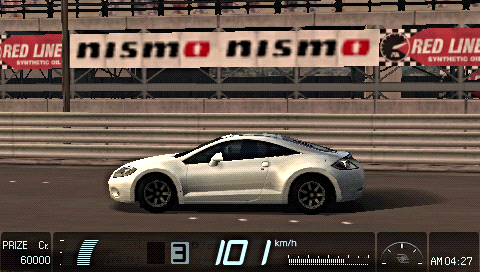 Even with the setting of the transmission in Automatic mode, I keep crashing the expensive car on walls and banks. I can’t even maneuver through tight spaces and other unseen blocks during fast driving sessions. The expensive car that I am talking about is the Ferrari Formula 1 driven by Kimi Raikonnen. I feel that I should apologize to racing legends and automobile makers around the world at that point. So I started with the slowest car possible and can accommodate to my current reflexes. I even set the transmission to automatic since I’m not a fast shifter. Slowly but surely though, I’m taking the Driving Challenges, and been much faster to the point where I can drive fast cars in rally cross tracks in sequential manual transmission (Yes, sequential manual transmission is the only option in the PSP game, but I wanted a driving wheel to confirm my driving in – game and how I shift gears at that point.). I also almost understood how hardening the springs and lowering ride height play a role in races, along with toes and camber angles. Aero only appears in some cars (looking at you, Mazda Furai). It even got to the point where it translated to actual driving lessons and tests. My teacher in driving even asked me if I belong to the refresher class for crashing a car. I just laughed. Funniest thing, I did the driving test without crashing and breaking a sweat. I safely maneuvered the car to the direction that the teacher intended. Shift to reverse, look at the back window and side mirrors while backing up, then change direction using the steering wheel. All of those actions happened in a span of less than 5 minutes. All while keeping alert of the surrounding cars, blocks, roads and the like. To make the long story short, the end result is that I passed. Yep, I passed, but I don’t have any cars to drive. So until that time comes, I’ll just cruise in the Bugatti Veyron model ‘09 in the game. Ah, this game is so nostalgic, Gran Turismo 2 is one of my first video games. I played with the Ps1 steering wheels, it was super fun, sad they didn't make unique gaming controller anymore. The game introduces me to the world of automobile, which probably the one that leads me liking mecha. Its wide range of car selection just wow me as a kid, I mean five-hundreds of playable cars, what game manage to do that back then. It has a stylish UI to show off cars too, I can spend hours picking which car I want to buy. My first favorite car is the Lotus Elipse series which I learn from the game, and even since my preference of car is the one built similarly like that (like Audi R8 for example). Yep, Audi R8 is based on the Quattro system, which explains the nimble handling. Same with some other cars like Lotus Elise, Ford GT and Mercedes Benz 190E. I'm just waiting for someone to sell me the PS3 with Gran Turismo 5 and 6 at an affordable price.